SHINthai Royal Oak review, pics, hours, and menu info. SHINthai Royal Oak is located on S Washington road at Lincoln road in Royal Oak. I had lunch with a friend at SHINthai Royal Oak recently and it was my first visit. We were both impressed by the food and menu options at SHINthai. And, we eat a lot of Thai food! You order at the counter at SHINthai, and then have a seat and wait for them to bring out your order. The SHINthai menu has several options and you can easily make substitutions, spot the gluten free options, and make your dish vegan. The staff is knowledgeable and kind. My friend ordered the Red Curry fried rice and I ordered the Drunken Noodles. I made a substitution with one of the vegetables in my dish and they were very accommodating. They also confirmed that there was no dairy. The curry dishes did have half and half… and they were ready to make them vegan for me if I ordered it. 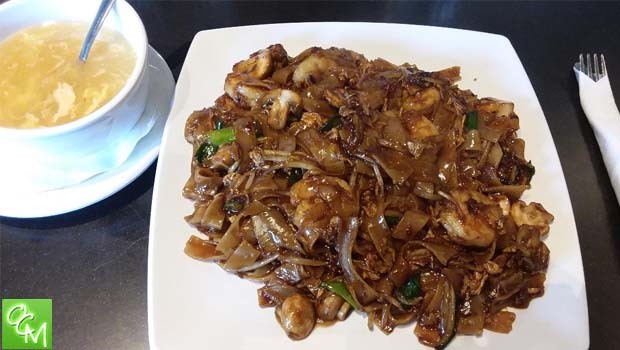 The SHINthai Royal Oak menu is loaded with all your favorite Thai dishes – noodle options such as Pad Thai, Pad Se’ew, Drunken Noodles; fried rice options with different variations such as pineapple, ginger, garlic, and curry; entrees that include Spicy Beef, Sesame Chicken, Pad Ped, Pad Prik and much more. Protein options that are available are chicken, pork, tofu, beef, scallops, shrimp, and imitation crab. Spice options are no spice, mild, medium, hot, and extra hot. My friend and I were both very happy with our food. The portions were good, food was fresh, temperature was hot, spice levels were spot on, soup of the day (e.g. egg drop soup) is served with every order, and the food came out to our table in what felt like a short 5 minutes. The service all around was super fast and pleasant. And, the interior was cozy, clean and modern. All around, a good experience! SHINthai also has online ordering through GRUBHUB, as well as delivery.